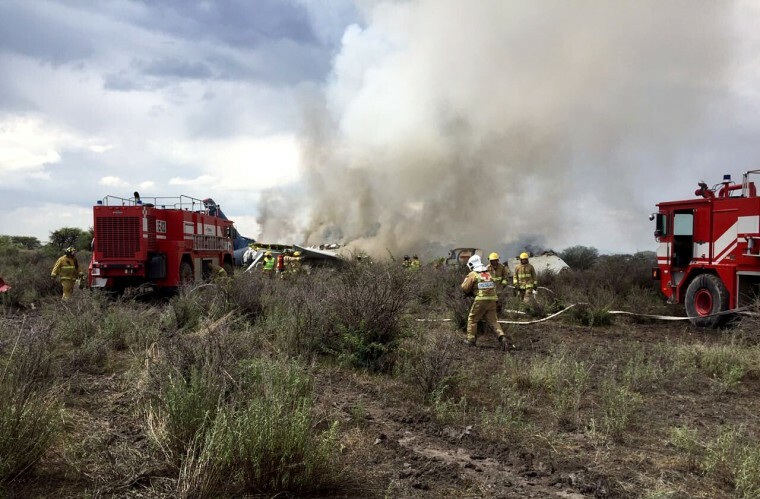 An Aeroméxico plane with 103 people aboard crashed Tuesday afternoon shortly after takeoff from General Guadalupe Victoria International Airport in the northwestern Mexican state of Durango, authorities said. No one among the 99 passengers — 88 adults, nine children and two infants, according to Aeroméxico — and four crew members was killed, José R. Aispuro Torres, the governor of Durango state. Earlier, he said 49 people were being treated at hospitals. Authorities initially said 101 people were aboard the flight, but Aispuro and the Transportation Ministry later updated the figure to 103, 101 of whom it said had been accounted for. It didn't say what was believed to have happened to the two missing people, but authorities and numerous reports from the scene said some passengers were able to walk away from the scene under their own power. The airport reopened Tuesday night. Among the injured was the Rev. Esequiel Sanchez, rector of the Shrine of Our Lady of Guadalupe in Des Plaines, Illinois, the Archdiocese of Chicago said. It said Sanchez was alert and resting. The plane, which the airline said was an Embraer 190 aircraft flying from Durango to Mexico City, took off at about 3:30 p.m. local time (4:30 p.m. ET) during a storm when it was hit by a gust of wind and went down about 1,000 feet from the runway, Aispuro said. Passengers were able to evacuate on the plane's emergency slides, he said. A woman who was in row 8 with her daughter told ADN40, part of Mexico's TV Azteca, that it was raining hard when the plane took off. She said passengers were thrown into seatbacks when the plane began descending. The woman, whose name ADN40 didn't reveal, said passengers began screaming when a fire erupted. A local government official told ADN40 that the plane had been flying at a low altitude just a few minutes after it took off. He said many people walked away from the scene. "Most people didn't want to be checked out because they were fine," he said. Grupo Aeroportuario, which operates the airport and others across Mexico, said weather was believed to be to blame. The Embraer 190 is a narrow-body medium-range twin-engine jet made by Brazilian manufacturer Embraer. The company said in a statement that the plane was delivered in May 2008 and that it had sent a team of technicians to the scene to help with the investigation.